Samaritan's Purse volunteer Dee, left, reads the parable of the Good Samaritan with homeowner Elaine. “Why are you called Samaritan’s Purse?” Elaine asked. The Louisiana homeowner wanted to know why an army of volunteers in orange shirts had come to her home to help after this summer’s flooding. So Dee, a Samaritan’s Purse volunteer and Site Leadership Team member, propped her broom against the wall, sat down on a plastic container in the living room, and began to explain. Dee shared with Elaine about the parable Jesus told of the Good Samaritan (Luke 10). They read the Scripture together, and Dee and her crew of volunteers encouraged Elaine and prayed with her. Volunteers remove kitchen appliances and cabinets. Our volunteers worked hard on Elaine’s home and other homes damaged by flooding in her Lafayette neighborhood. They sorted through items to determine what could be salvaged; put ruined furniture at the curb; pulled up nails; removed soggy floors, drywall, and insulation; swept floors; and sprayed for mold. Being displaced after the flooding was especially hard on Elaine’s 12-year-old son, who is autistic and recently diagnosed with epileptic seizures. Volunteers make sure the floors are clean before they spray for mold. Water sat in Elaine’s home for one week, and by the time it receded almost everything inside was ruined. Elaine and her son have bounced from one family member’s house to the next as they wait to move back into their home. “There was so much running through my head—what am I going to do? Who is going to help me?” she said. She was truly grateful for the response of our team in her time of need. So far, our volunteers have spent nearly 66,500 hours assisting more than 750 homeowners across all three sites. Not only do our staff and volunteers bring physical relief, but they also bring the hope and peace of Jesus Christ. Among our three bases of operation, 216 people have come to faith in Jesus through the witness of Samaritan’s Purse and Billy Graham Rapid Response Team chaplains. Seeing the Gospel change lives is why Dee volunteers with Samaritan’s Purse. In Lafayette, she had opportunity to share the Gospel with Mark, who told her he didn’t know if he would go to heaven or hell when he died. As Dee and her team gutted out Mark’s home, they got to know him, his two siblings, and his mom, Louise. After Dee shared the Gospel, Mark prayed to receive Christ. “That’s what it’s all about. It’s about people needing Christ,” Dee said. Dee’s first volunteer experience with Samaritan’s Purse came seven years ago when we deployed to Dallas, Georgia, and her church served as host church for our response. Dee answered the phones and helped take work orders from homeowners devastated by the flooding. Dee and her team remove debris and damaged belongings. Our volunteers on the job sites, however, got her attention. “I kept seeing all these people coming in dirty, muddy, grungy, and they smelled terribly. But they were all smiling and had really awesome stories,” she said. When Dee learned that these volunteers were working alongside homeowners she had to join in, and now has her own stories to tell of God’s faithfulness. Dee and her team met and served a number of homeowners in Elaine’s neighborhood, including Delilah, who suffered a massive heart attack a few years ago and almost died. Delilah was excited to receive a Billy Graham Training Center Study Bible, signed by volunteers who worked on her home. The National Guard rescued Delilah from the floodwaters, but that was just one part of her ordeal. She said the rancid odor due to sewage backup would become almost as horrifying as the rising water. Despite the fact that most homes in their neighborhood required a mud-out, God brought good out of devastation. A volunteer helps Joann sort through salvageable belongings. Across the street from Delilah is 79-year-old Joann who also lives alone and barely got out of her house in time. Joann’s husband died three years ago. She is staying with her daughter for now because the flood destroyed most of her furniture and belongings. Joann couldn’t believe how hard our volunteers worked in her home. U.S. Disaster Relief Samaritan's Purse mobilizes and equips thousands of volunteers to provide emergency aid to U.S. victims of wildfires, floods, tornadoes, hurricanes, and other natural disasters. In the aftermath of major storms, we often stay behind to rebuild houses for people with nowhere else to turn for help. 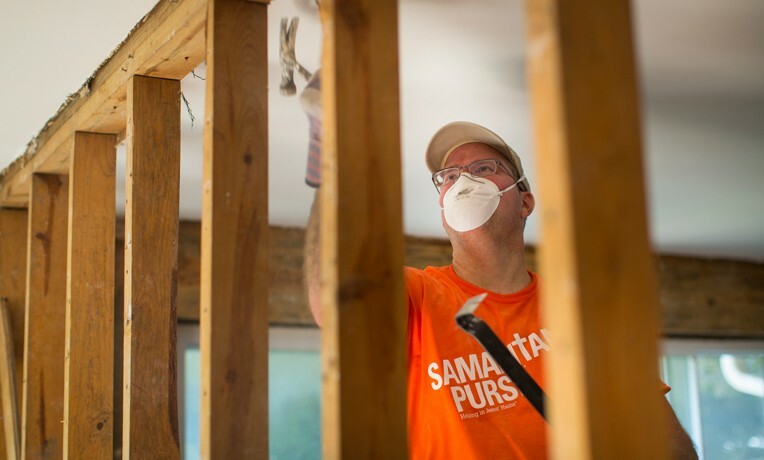 Samaritan's Purse mobilizes staff and equipment and enlists thousands of volunteers to provide emergency aid to victims of tornadoes, hurricanes, wildfires, floods, and other natural disasters in the United States. We often stay behind after our initial response to rebuild or restore houses for needy families.